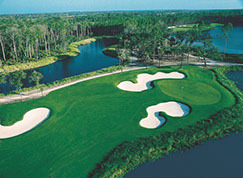 Hammock Dunes is a private, gated community located on the northeast coast of Florida. 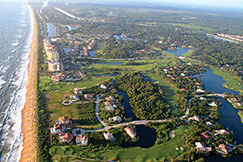 It includes over two and one-half miles of oceanfront property as well as lakefront and golf course lots. In addition, the community has more than five miles of Intracoastal Waterway frontage, with most Waterway lots including deep water boat docks, making Hammock Dunes one of the few places in America where you can dock your boat in your backyard and walk to the ocean. The community has 1220 properties, all of which were sold by 2013 by the original developers. 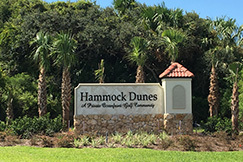 Hammock Dunes is administered by the twelve-member Board of Administrators of the Hammock Dunes Owners’ Association (HDOA), which owns all developer rights for the community and is the producer of this website. Various Board committees manage the HDOA’s responsibilities, which include strategic planning, maintaining and enhancing all common properties and facilities, and establishing and enforcing community standards such as architectural and landscaping requirements and a strictly limited rental policy. The HDOA contracts with a property management firm to carry out day-to-day operations. Property owners have the option of joining the Hammock Dunes Club, with its impressive array of amenities and activities. 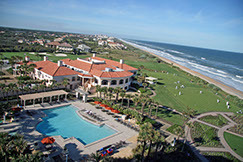 These include two Audubon-certified golf courses; a swimming pool and fitness center; two beachside croquet courts; tennis, bocce, and pickleball courts; and an oceanfront clubhouse. The Club has been named both a Distinguished Emerald Club of the World and a Platinum Club of America, awards representing the highest level of recognition a private club can receive. The Club’s Tom Fazio-designed Links Course meanders through the community and has three holes on the ocean. The Rees Jones-designed Creek Course, located on the mainland approximately seven miles from the Links Course, was built on 680 acres of pristine forest and marshland and has its own clubhouse. With no homes or condominiums on the property, it offers sweeping vistas and a quiet, serene environment for golf. Hammock Dunes is the FIRST private community in Florida to achieve "Audubon International Sustainable Community" certification with its award in November 2018. This certification compliments Hammock Dunes Club's Links and Creek golf course certifications as "Audubon Cooperative Sanctuaries", reflecting Hammock Dunes' commitment to the environment and protection of endangered species. Despite Hurricanes Matthew's and Irma's visits during 2016 and 2017. Hammock Dunes has proven unwavering commitment to a healthy local environment, quality of life for its owners and the local economic vitality. 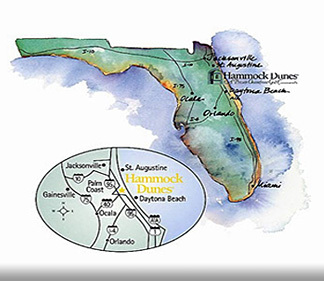 We welcome you to explore this website to learn more about what Hammock Dunes has to offer. With its attractive location, wide range of residence options, and award-winning private club, it may be just the community you are seeking for either a second home or a full-time retirement home. Visits to Hammock Dunes can be easily arranged through a concierge service whose contact information is available at the “How to Visit” link above.